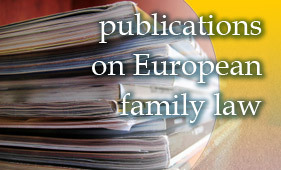 On this page, you will list find a list of publications in the field of European family law. The list is updated regularly by the Organisaing Committee of the Commission on European Family Law. If you have a publication that you feel should be listed on this page, please send an email to the secretariat via the contact page on this website. M. Roth Buduce Brakorazvodno Pravo – Dva Tipa Razvoda Braka [Das Scheidungsrecht der Zukunft – Zwei Arten der Scheidung] Evropski Pravnik 2006-2, p. 69 et seq. I. Lund-Andersen Hamonisering af europæsik familieret in: M. Holdgaaard and A. López-Rodríguez (eds.) Globalisering og Familieret (2004) p. 110-117. D. Martiny Is unification of family law feasible or even desirable? in: A. Hartkamp et al (eds. ), Towards a European Civil Code, Ar Aequi Libri, Nijmegen, 3rd Edition, 2004, p. 307-333.